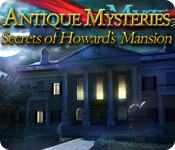 Antique Mysteries: Secrets of Howard's Mansion is rated 3.9 out of 5 by 117. Rated 5 out of 5 by Suelovesgames from Has a certain je ne sais quoi This is a wonderful game with the right balance of mini puzzles, HOS and in-game puzzles. It's exciting, intriguing and atmospheric. The graphics could have been a bit more interesting but they were okay. I'm prepared to overlook that and still give it five stars because it's special, unique and quirky but in a classy way. But most of all, it's memorable and I'll be playing it again at some point. You really feel ike you're on a journey in this game. It's quite sequential and well paced and puzzles are fun too. An unexpected treat. It delivered more than it promised. Even though, it's exciting, it still remains relaxing. I'm not quite sure how it gets that balance but it does. SPOILER The thing that makes this game memorable is...I'll say one word - Gnomes. Gnomes give this game a certain je ne sais quoi. If you like gnomes, you will love this game. Rated 5 out of 5 by lahdeeda from Great Game! Worth the Buy! 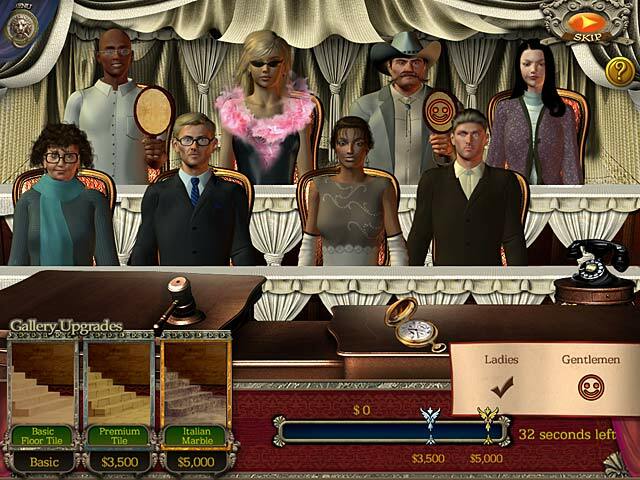 Fun combination of hidden object and mini-games, and, unlike most games, the mini-games actually have a greater purpose in the plot-line. I found the gnomes a little annoying, but nothing too bad. Easy to navigate, and a fun mystery game without being dark. Only way to improve would be to allow access to the mini-game auction after completion of game. Rated 5 out of 5 by sroebuck117 from Refreshing! Great twist for a HOG! Really fun HOG. Different than your average, spooky HOG. 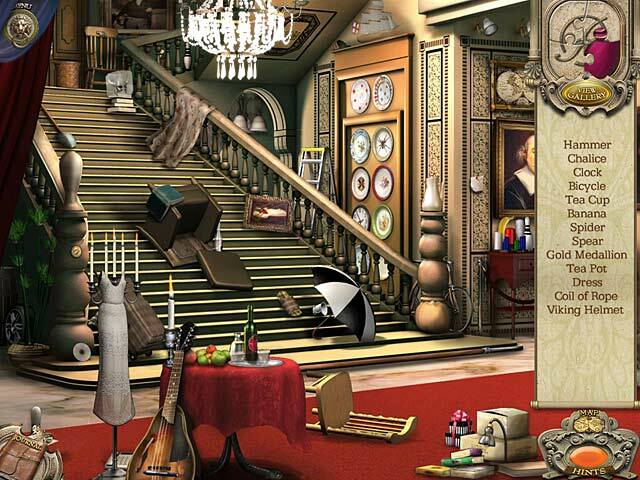 You had objectives, side tasks, and puzzles along with the hidden objects. Some puzzles were quite challenging! Rated 5 out of 5 by Mickeycb from I really liked this game. Give it a chance, its a great game. Rated 5 out of 5 by rosekaufmann from FUN FOR THE ENTIRE FAMILY; GNOMES CAN'T DANCE BASICS: 7 Chapters. Notes are strewn about; collect them and they will be recorded in your journal. The journal will also record your objectives and, if you want, give you a hint of obtaining them. You can mute sound and hide tips. Jaunty music. There are scrolls in scenes which must be picked up before you get the list of objects to collect. STORYLINE: You are called to recently deceased Tycoon Howard’s mansion to restore his antique collection, which has been scattered around the estate, including secret rooms. You occasionally find ominous notes from Howard; later, they sound funny as he becomes exasperated. One thing I’ve learned: gnomes can’t dance, though they appear to have fun trying. Ending was as I suspected it might be as I passed the midpoint of the game. GAMEPLAY: Sometimes it is difficult to get the inventory to automatically attach to the cursor. HOS are large, not overly crowded. Very wide variety of new and unique puzzles, which vary from easy to moderately difficult. Some of the scenes and puzzles are an awful lot of fun – don’t know which would be my favorites. The upside down room was ingenious (it’s not just upside down; it’s what it does). The High Noon Painting puzzle with the Last Chance Saloon was absolutely fabulous. Loved the 3 carpentry projects – very unique way of handling. The developers really thought outside the box. OTHER STUFF: Map looks interactive, but it’s not except for opening the next area. No matter what room you click, you’ll end up in the next area. The map just shows you the layout of the land. Graphics are bright and crisp. Not much dialogue. It would be perfect if you could play just the games after finishing the game. Rated 5 out of 5 by MsA59 from A Brilliant Game This game has gorgeous graphics, nice music. Overall it is an interesting game. It's one of my favorites. Rated 5 out of 5 by Cheralynn48 from FUN game! This is my first review - and I am only doing it because this was a very fun game! Lot's of changing scenes, lots of action and a cute story. Love it! Rated 5 out of 5 by FishyFemale from More fun than I expected! I bought this little gem of a game because it looked different from the usual dark and sinister games that I normally gravitate to. Even though the puzzles and minigames were very easy, sometimes I like to do easy games just for the relaxation they offer when I don't want to think too much. This is one of those games and it was surprisingly fun. I especially enjoyed the animations like the train and the dancing gnomes. And the game where you have to put the missing pieces on the western painting and then enter the saloon for another game was very unique. It was a fun ride all around and the bonus of the auction was an added touch. The graphics look a little dated but that's no reason why you can't enjoy this game. Try it out and see how she rides. I think you'll like it. Rated 5 out of 5 by Eventually from love this game Finally a HO with puzzles that is not dark & gloomy!! Good story & I usually don't have the sound on, this one is ok. A little bit sticky with getting back to the same scene & some of the puzzles are challenging. Great game to play on on lazy afternoon. 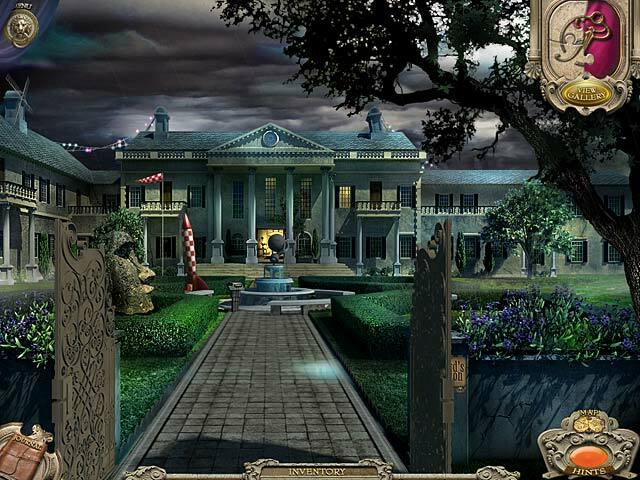 Unlock the secret rooms in the Howard’s mansion and restore a precious antique collection hidden there.